1968 Volkswagen Karmann C... 11995 1940 Ford 2 Door Sedan 39995 2008 Lexus RX 400h $12,995 1995 BMW 3 Series $3,495 1999 Chevrolet Corvette $17,995 0000 Unknown Call for Pricing. The Nash Metropolitan was an American automobile that was sold from 1953 to 1961. It conforms to two classes of vehicle: economy car and subcompact car. In today's terminology the Metropolitan is a "subcompact", but this category had not yet come into use when the car was made. At that time, it was variously categorized, for example as a "small automobile" as well as an "economy car". The Metropolitan was also sold as a Hudson when Nash and Hudson merged in 1954 to form the American Motors Corporation (AMC), and later as a standalone marque during the Rambler years, as well as in the United Kingdom and other markets. While most U.S. automobile makers were following a "bigger-is-better" philosophy, Nash Motor Company executives were examining the market to offer American buyers an economical transportation alternative. The Metropolitan was designed in the U.S. and it was patterned from a concept car, the NXI (Nash Experimental International), that was built by Detroit-based independent designer William J. Flajole for Nash-Kelvinator. It was designed as the second car in a two car family, for Mom taking the kids to school or shopping or for Dad to drive to the railroad station to ride to work: the "commuter/shopping car" with resemblance to the big Nash, but the scale was tiny as the Met's wheelbase was shorter than the Volkswagen Beetle's. The NXI design study incorporated many innovative features, and attempted to make use of interchangeable front and rear components (the symmetrical door skins were the only interchangeable items that made it into production). Although more complex, the new vehicle also incorporated Nash's advanced single-unit (unit body) construction. It was displayed at a number of "surviews" (survey/previews), commencing on 4 January 1950 at the Waldorf-Astoria Hotel, New York, to gauge the reaction of the American motoring public to a car of this size. The result of these surviews convinced Nash that there was indeed a market for such a car, if it could be built at a competitive price. A series of prototypes followed that incorporated many of the improvements from the "surviews" that included roll-up glass side windows, a more powerful engine, and a column-mounted transmission shifter with bench seat (rather than bucket-type seats with floor shift fitted in the concept car). The model was named NKI (for Nash-Kelvinator International), and it featured revised styling incorporating a hood blister and rear wheel cutouts. Nash was positioning this new product for the emerging postwar market for "personal use" autos. These specific use vehicles were as a second car for women or an economical commuter car. The Metropolitan was also aimed at returning Nash to overseas markets. However, Mason and Nash management calculated that it would not be viable to build such a car from scratch in the U.S. because the tooling costs would have been prohibitive. The only cost-effective option was to build overseas using existing mechanical components (engine, transmission, rear end, suspension, brakes, electrical), leaving only the tooling cost for body panels and other unique components. With this in mind, Nash Motors negotiated with several European companies. On October 5, 1952, they announced that they had selected the Austin Motor Company (by then part of BMC) and Fisher & Ludlow (which also became part of BMC in September 1953, later operating under the name Pressed Steel Fisher), both English companies based in Birmingham, England and vicinity. Fisher & Ludlow would produce the bodywork, while the mechanicals would be provided, as well as final assembly undertaken, by the Austin Motor Company. This was the first time an American-designed car, to be exclusively marketed in North America, had been entirely built in Europe. It became a captive import a foreign-built vehicle sold and serviced by Nash (and later by American Motors) through its dealer distribution system. It is believed that the first pre-production prototype was completed by Austin on December 2, 1952. In all, five pre-production prototypes were built by Austin Motors and tested prior to the start of production. The total tooling cost amounted to US$1,018,475.94, (Austin: US$197,849.14; Fisher & Ludlow: US$820,626.80) which was a fraction of the tooling cost for a totally U.S.-built vehicle. The styling for all Nash vehicles at that time was an amalgam of designs from Pinin Farina and his design house of Italy and the in-house Nash design team. The different models from Ambassador down to the Metropolitan utilised very similar design features (fully enclosed front wheels, notched "pillow" style door pressing, bar style grille etc.). 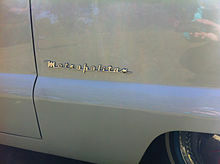 Whilst Nash used the fact that styling was by Pinin Farina in their advertising for their larger models, Farina refused to allow his name to be associated with the Metropolitan as he felt it would damage his reputation with other Italian car companies to be linked to such a small car. The Metropolitan was the first postwar American car that was marketed specifically to women. The Dodge La Femme was introduced one year later. The first spokesperson for the car was Miss America 1954, Evelyn Ay Sempier, and the car was prominently advertised in Women's Wear Daily. American Motors' marketing brochures described the new model as "America's entirely new kind of car" (1955), "Luxury in Miniature" (1959), and "crafted for personal transportation" (1960). Initial reviews of the Metropolitan were mixed. However, owners of the cars reported that the "Metropolitan is a good thing in a small package". Automotive industry veteran and the largest publisher of automotive books at the time, Floyd Clymer, took several Metropolitans through his tests. He "abused" a 1954 Metropolitan convertible and "got the surprise of my life" with its "performance was far better than I expected", that he "felt very safe in the car", and that "it may well be that Nash has started a new trend in American motoring. Perhaps the public is now getting ready to accept a small car". Clymer also took a 1957 Metropolitan hardtop through a grueling 2,912 mi (4,686 km) road test that even took him 14,100 ft (4,300 m) up Pikes Peak. He summed up his experience that "I can not praise the Metropolitan too highly. It is a fascinating little car to drive, its performance is far better than one would expect, and the ride is likewise more than expected". According to Collectible Auto magazine, the car was described in Car Life's review as "a big car in miniature" that was "fun to drive" and "ideal for a second car in the family," while Motor Trend was not alone in regarding the rear "utility" seat as "a joke." 30.1 mpgUS (7.8 L/100 km; 36.1 mpgimp) "in traffic." Mechanix Illustrated editor Tom McCahill wrote: "It is not a sports car by the weirdest torturing of the imagination but it is a fleet, sporty little bucket which should prove just what the doctor ordered for a second car, to be used either for a trip to the movies or for a fast run to a penicillin festival." He added that it was a "nice-handling car with plenty of control and amazing dig, considering it is powered by a small Austin A-40 engine" and that the finish was "very nice", although having no trunk opening except by pulling down the back of the rear seat "poses a problem." His test car accelerated from 0 to 60 mph in 19.3 seconds and could exceed 70 mph (110 km/h). A Road & Track road test recorded acceleration from 060 mph in 22.4 seconds, "almost half of the VW's 39.2." However the magazine noted that at 60 mph (97 km/h), a common American cruising speed at the time, the Metropolitan was revving at 4300 rpm, which shortened engine life, whereas the Volkswagen could travel at the same speed at only 3000 rpm. Road & Track's testers also said that the car had "more than its share of roll and wallow on corners" and there was "little seat-of-the-pants security when the rear end takes its time getting back in line." Road Test magazine said in 1954 that "on roadability and responsive handling, the Met shines. It also offers easy maintenance and downright stinginess when it comes to gasoline consumption. Also, it's literally a brute for punishment. On several occasions I took familiar corners at speeds half again what I would dare to use in some cars of twice the weight proof that proper weight distribution, low center of gravity and well engineered suspension have more to do with roadability than massiveness, weight and long wheelbases. Admittedly, the short wheelbased Met does pitch moderately on very rough roads, but the sensitivity and ease of steering make driving a pleasure." Production at Austin's Longbridge factory started in October 1953 (Commencing VIN E1001). Nicknamed the "baby Nash", the cars were tiny. They had an 85 in (2,159 mm) wheelbase, overall length of 149.5 in (3,797 mm) and a gross weight of only 1,785 lb (810 kg) for the Convertible and 1,825 lb (828 kg) for the Hardtop, thus making the Metropolitan smaller than the Volkswagen Beetle. The two models, a convertible and a hardtop, were powered by the OHV 1,200 cc (73 cu in) straight-4 Austin 'A40' series engine (as used in the Austin A40 Devon/Dorset) driving the rear wheels through a three-speed manual transmission. The initial order was for 10,000 units, with an option to increase the order if sales were sufficient. The new model was initially to be called the "NKI Custom", but the name was changed to "Metropolitan" just two months before its public release. New chrome nameplates with the "Metropolitan" name were made to fit into the same holes as the "NKI Custom" script on the passenger side front fender. Nash dealers had to rebadge the early cars that came with the "NKI Custom" name, but some factory manuals had already been prepared and distributed to service departments with the NKI name. The first examples badged as Nash went on sale on March 19, 1954 in the U.S. and Canada. Autocar said that "at a production rate of less than 400 cars a week ... it was hardly going to be a runaway best seller." In surveys, Americans had affirmed a desire for economy cars, but in practice they bought the Metropolitan in relatively small numbers. Although Nash merged with Hudson in 1954, and marketed the car as a Hudson Metropolitan in 1955, "demand never took off from the original level", primarily because the Metropolitan was slow by North American standards. In the first month of sales, 862 Metropolitans were sold in U.S. and Canada, while in the first six months a total of 7,042 were sold. A further order was placed with Austin. Available exterior colors were P903 "Spruce Green", P904 "Canyon Red", P905 "Caribbean Blue", or P906 "Croton Green", with P907 "Mist Grey" as a contrast color for the hardtops. P906 "Croton Green" was dropped as a color option in April 1954. Cars incorporated the Nash logo on their grille badge, hubcaps, horn button, and spare wheel cover. The suggested retail price(MSRP) for Series I (also known as NK1) models was US$1,445 (Hardtop) and $1,469 (Convertible). Adding a radio and a heater pushed the price above $1,500: at the time Volkswagen's Bug/Beetle was being offered at $1,425. In May 1954, Nash-Kelvinator Corporation announced that it had merged with the Hudson Motor Company to form American Motors Corporation (AMC). Thus by August 1954, Metropolitans also became available from Hudson dealers. These Hudson Metropolitans carried a Hudson grille badge, hubcaps incorporating an "M" logo, a "bulls-eye" horn button design, and a plain spare wheel cover. Braking performance was 90 ft (27.4 m) from 45 miles per hour (72 km/h) to a full stop. In 1954, George Mason took two Metropolitans to Raleigh Speedway in North Carolina for some tests. The first Metropolitan did a 24-hour endurance run, going a total of 1,469.7 miles (2,365 km) without the need for a tune up, while the second car was put to a 24-hour fuel economy run. It averaged 41.7 mpgUS (5.64 L/100 km; 50.1 mpgimp). After the first 10,000 cars were built, the engine was changed to a B-Series, but still of 1,200 cc (73 cu in), (as used in the Austin A40 Cambridge). Other modifications that were incorporated at this time were a new gearbox, and hydraulic actuation for the clutch (Series I models used a mechanical clutch linkage). The change to a new engine and gearbox added 50 lb (23 kg) to the weight. This model is referred to as Series II or NK2 (Commencing with Vehicle identification number (VIN) E11001 on August 19, 1954). November 1955 saw the start of Metropolitan Series III (NK3) production (Commencing with VIN E21008 on 28 November 1955). A redesign at this time saw the Metropolitan's B-Seriesengine increased in capacity to 1,498 cc (91.4 cu in) (as used in the Austin A50 Cambridge). Polished stainless steel sweep-spears on the body sides allowed a new two-tone finish to be incorporated, which had the cosmetic effect of lowering, slimming and lengthening the car. The new exterior colors were P905 "Caribbean Green", P910 "Sunburst Yellow", and P911 "Coral Red" with P909 "Snowberry White" as a contrast. The grille was also redesigned, and the hood had its non-functional hood scoop removed. American Motors changed the designation to "Metropolitan 1500" to differentiate it from the earlier 1,200 cc (73 cu in) models. The interior was also changed to incorporate a "houndstooth" check material for the seats trimmed with white vinyl. The dashboard was also now painted black, rather than the body color as was the case for Series I and II Metropolitans. The MSRP for Series III models was $1,527 (Hardtop) and $1,551 (Convertible). After VIN E35133 (16 April 1957) the exterior colors were changed to P910 "Sunburst Yellow", P912 "Berkshire Green", and P913 "Mardi-Gras Red" with P914 "Frost White" as contrast. After VIN E45912 (9 January 1958), the color P910 "Sunburst Yellow" was replaced by P915 "Autumn Yellow" and P908 "Classic Black" was added to the available exterior colors. In September 1957, AMC announced that it was dropping the Nash and Hudson brand names. The Metropolitan was subsequently marketed under the "Metropolitan" name only, and sold through Rambler dealers. It is believed that the Nash and Hudson Grille medallions were discontinued around October 1956 (VIN E28326); they were replaced with the "M" style grille medallion. January 1959 saw the start of Metropolitan Series IV (NK4) production (Commencing with VIN E59048 on 12 January 1959). This major redesign saw the addition of an external decklid(previous models only allowed access to the trunk through the rear seat back) and vent windows. By this time, the engine had been upgraded by increasing the compression ratio from 7.2:1 to 8.3:1 (Commenced VIN E43116 October 15, 1957) giving an output of 55 bhp (41 kW) (as used in the Austin A55 Cambridge). The additional features added 15 lb (6.8 kg) to the weight. Exterior color options were the same as for Series III. The interior now used a diamond pattern for the seats, with white vinyl trim. The MSRP for Series IV models was $1,672.60 (Hardtop) and $1,696.80 (Convertible). Sales rose to 22,209 units in 1959, the Metropolitan's best-selling year, promoting it to second place behind Volkswagen in sales of cars imported to the U.S. American Motors' advertising made much of this ranking, while omitting mention that the Volkswagen outsold the Metropolitan by 5 to 1. Production ceased in April 1961 (final VIN E95981, built April 19, 1961). Sales of the existing inventory continued until March 1962. A station wagon version was contemplated by AMC, and two prototypes were built, but the project was abandoned. One of the two prototypes has been restored and is on display at a Metropolitan restoration facility in North Hollywood, California. Approximately 95,000 Metropolitans were sold in the United States and Canada, making it one of the top-selling cars to be imported into those countries at the time, and its sales in 1959 helped to spur the introduction of the Big Three's (General Motors, Ford, and Chrysler) new compact models. To establish the production date for a Metropolitan (U.S. and Canadian models only), check the VIN or Serial number on a data plate affixed to the firewall. The number is prefixed by the letter "E". Check this number against the list below, to establish an approximate production date. NB. Since the cars took at least six weeks to be shipped from the Longbridge factory to the U.S. distribution network, the actual titled date will not be the same as the production date. In October 1956, Austin Motor Company obtained permission from American Motors to sell the Metropolitans in overseas countries where AMC did not have a presence. The early brochures for the Austin Metropolitans used a reversed photograph to show an apparently right hand drive (RHD) car parked in an English country town (Chipping Campden), because only left hand drive vehicles were available at the time the photos were taken.